Glaucoma is a group of eye conditions in which damage to the optic nerve leads to loss of vision. Because the vision loss is often gradual and there are few other symptoms, many people in the early stages of glaucoma are unaware they have it. Glaucoma is much more common in people aged 40 years and over. The exact causes of glaucoma are not completely understood. Glaucoma is often associated with raised intraocular pressure. The eye is filled with a fluid called aqueous humour, which drains out through a structure called the anterior chamber angle (located where the cornea and iris join). If this becomes blocked, the aqueous humour can not drain out and pressure inside the eye, called intraocular pressure, rises. 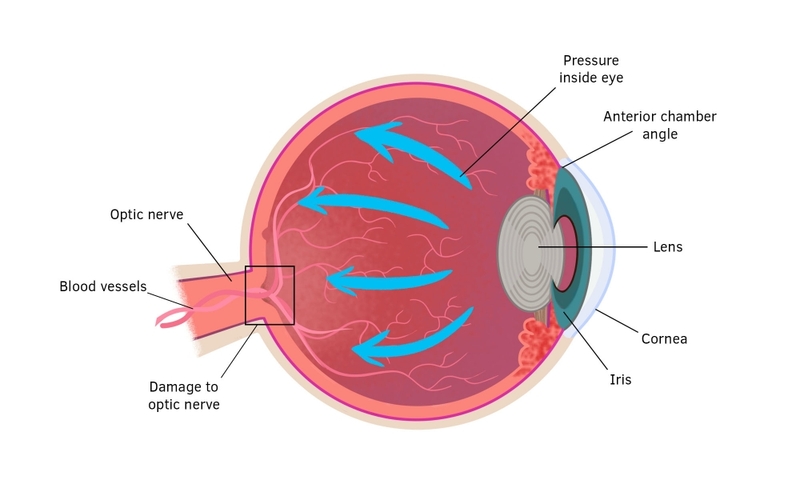 Increased intraocular pressure is associated with damage to the optic nerve, which is made up of millions of nerve cells that transmit visual signals from the eye to the brain. Nerve cells that transmit peripheral vision are more vulnerable to damage - this is why peripheral vision tends to be affected more than central vision. An increase in intraocular pressure can damage the optic nerve and cause glaucoma. Open-angle glaucoma occurs when, despite the anterior chamber angle being open, the drainage becomes blocked. It is the most common type of glaucoma, but its cause is unknown. Most people with open-angle glaucoma are affected in both eyes. Open-angle glaucoma tends to run in families and is more common in people who have myopia (short-sightedness). People of African descent have an increased risk of developing this form of glaucoma. Normal-tension glaucoma is a form of open-angle glaucoma in which damage still occurs to the optic nerve even though intraocular pressure is normal. The cause of normal-tension glaucoma is not known. Angle-closure glaucoma occurs when the iris and cornea are too close and block the flow of fluid into the anterior chamber angle. It can develop slowly over time, but symptoms frequently occur suddenly - this is sometimes called an 'acute attack'. An acute attack of angle-closure glaucoma affects one eye at a time, but the other eye is often at increased risk of a later attack. People of Asian descent have an increased risk of developing this form of glaucoma. Symptoms can include redness of the affected eye, severe eye pain and sensitivity to light. Some people report seeing halos, or coloured rings around lights. Without treatment, an acute attack of angle-closure glaucoma can lead to significant, irreversible vision loss within days. Secondary glaucoma is a result of damage or changes to the structures of the eye that cause a blockage in aqueous humour outflow. Medications that cause pupil dilation. These drugs can lead to acute attacks in some people already at risk of angle-closure glaucoma. Some examples include some medications for Parkinson's disease, depression and allergy. Congenital glaucoma occurs in infants due to eye structures that do not form correctly. It can run in some families. The main symptom of early glaucoma is vision loss, specifically the gradual loss of peripheral (or side) vision. When peripheral vision becomes very restricted, it is sometimes called tunnel vision. As glaucoma progresses, people can experience difficulty in low-light conditions, or with their mobility. If left untreated, glaucoma can cause blindness. However, treatment can slow or prevent further vision loss and, when managed, glaucoma rarely results in blindness. Most people with glaucoma do not experience any pain or discomfort. However, this is not always the case. With forms of glaucoma associated with rapid rises of pressure inside the eye, symptoms can include severe pain in the affected eye and sensitivity to light. A regular eye examination by an optometrist or ophthalmologist can help to diagnose glaucoma early. Several tests can be performed to help diagnose the condition. Ophthalmoscopy is used to view the back of the eye. Eye drops may be used to dilate the pupils to improve the view. These drops can blur vision for a couple of hours after the exam. In some cases, a photograph of the back of the eye (fundus photography) may be taken to record the appearance of the retina and optic disc, to help monitor any changes that occur over time. Tonometry is used to measure the pressure inside the eye. There are different types of tonometers; some touch the surface of the eye (the cornea is numbed with anaesthetic drops), while others blow a puff of air. A visual field test can be used to assess the extent of vision loss caused by glaucoma. Usually, visual field tests for glaucoma are done via a technique called automated perimetry. This involves sitting in front of a machine and focusing on a central target in the middle of a dome. You will be asked to press a button whenever you see a small light flash in the periphery of your vision. A slit lamp is an instrument similar to a microscope that allows examination of the deeper parts of the eye, including the iris and lens. A small lens called a gonioscope is used to examine the anterior chamber angle of the eye. In Australia, treatment for glaucoma may be provided by an ophthalmologist, or by an optometrist under the supervision of an ophthalmologist. Personal circumstances that may affect treatments such as eye drops. Your ophthalmologist or optometrist will discuss which treatments are most appropriate for your situation. The most common treatment for open-angle glaucoma is eye drops to help reduce intraocular pressure. Depending on the type of eye drop prescribed, most people put drops in their eyes one or more times a day. Once treatment is started, you will usually need to continue with it permanently, unless your ophthalmologist or optometrist advises differently. There are a number of different types of eye drops to treat glaucoma. Prostaglandin analogues, such as latanoprost and travoprost, are commonly-used drugs to treat glaucoma and work by increasing the flow of aqueous humour out of the eye. They have side effects, such as darkening the colour of the iris and increasing eyelash growth. They may not be recommended if only one eye requires treatment. Beta blocker drugs, such as betaxolol and timolol maleate, work by reducing the amount of aqueous humour the eye produces. Because they can potentially affect respiratory and cardiovascular conditions, they may not be suitable for people who have, or are at risk of, those conditions. If you use these drugs, your eye doctor may ask you to do something called punctual occlusion (squeezing the tear ducts against the bridge of the nose) when you put in your eye drops to keep as much of the drug in the eye as possible. Alpha agonists, such as brimonidine tartrate, work to both lower aqueous humour production and improve outflow. However, they can cause allergic reactions and other side effects such as, headaches and dryness of the mouth and nose. CAIs, such as acetazolamide, reduce aqueous humour production and can be taken as eye drops or oral medications. In eye drop form they can cause stinging and discomfort, while with oral medications, side effects can include depression, frequently feeling the need to urinate, an upset stomach and tingling in hands and feet. There are some eye drops that are combinations of the drug types listed above (for example, a beta blocker and a CAI, or an alpha agonist plus a beta blocker). In some cases, combining medications reduces the number of drops you need to put in your eyes each day and makes it easier to manage glaucoma. Your ophthalmologist or optometrist can discuss whether a combination drug will suit you. Laser treatment is painless and performed while you are awake. It can help improve drainage in the anterior chamber angle and reduce intraocular pressure. Unfortunately, results are often not permanent. While eye drops are usually the first option for treating open-angle glaucoma, laser treatment may be recommended for people for whom eye drops are not effective or not well tolerated. It is sometimes recommended as the first option for treatment. Your ophthalmologist can discuss the best options for your situation. If drops and laser treatments are not effective, there are some surgical treatments available to reduce intraocular pressure. Surgery may be used to improve drainage or reduce the production of aqueous humour. Surgery is done under general anaesthetic, while you are asleep. Your ophthalmologist will discuss whether surgery is appropriate for your situation. Eye drops, oral medications or intravenous (IV) drugs may be given to reduce intraocular pressure. Carbonic anhydrase inhibitors are an example of a drug that may be used. A painless laser can be used to make a small hole in the periphery of the iris in order to create a permanent channel between the back of the eye and the anterior chamber. This is called an iridotomy and will generally prevent a future acute attack. Because the unaffected eye is usually at increased risk of a future angle closure attack, an iridotomy is often recommended in the unaffected eye, as a preventative measure. In some cases, treatment of the underlying condition that caused the glaucoma may be all that is required. If this is not the case, treatments such as those detailed for open angle glaucoma above may be recommended. Surgery, performed under general anaesthetic, is commonly used to treat congenital glaucoma. In some cases, eye drops such as those used for open-angle glaucoma may also be necessary to control intraocular pressure. Once nerve damage has occurred, it is not possible to reverse it. Untreated, glaucoma can lead to significant vision loss and, in some cases, blindness. Treatments can be very effective at slowing and preventing further vision loss. When treated, glaucoma rarely results in blindness. With the exception of some cases of acute angle closure glaucoma, it is not possible to prevent glaucoma. Having regular eye exams by your optometrist/ophthalmologist can help to detect signs of glaucoma as early as possible.